Can you touch anywhere on your body with your right hand? Replying quickly, you might say you can. But what about your right elbow? You can’t touch that with your right hand. Science is like that, because distant things are often easier to study and understand than close things. We have a good understanding of how stars work, for example, but not of how the earth’s magnetic field is generated. And while we’ve been able to predict solar eclipses for millennia, we still can’t predict earthquakes or volcanic eruptions. 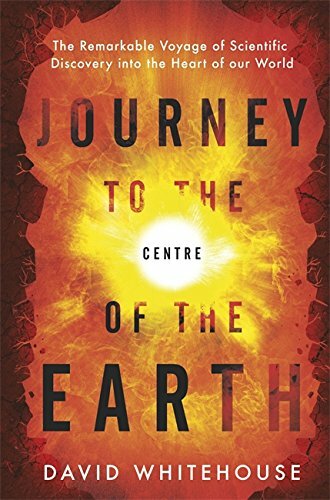 Understanding the deep earth is difficult, so there are a lot of mysteries and conjectures in this well-written and compelling book about the interior of our home planet. Scientists have landed probes on Mars, millions of kilometres away, but the “deepest hole ever drilled on earth – the Kola Superdeep borehole in northern Russia” reached only 12,262 metres. That’s a mere pinprick by comparison with the radius of the earth. To get beyond that, scientists have had to study the shockwaves generated by earthquakes. The medium is the message: as the waves pass through or hit different regions and materials, they behave in different ways. For example, when the Croatian scientist Andrija Mohorovičić (1857-1936) “studied the records from several seismometers” after an earthquake near Zagreb, “he realised that some of the shockwaves […] were being reflected back to the surface from a boundary region between the crust and mantle.” (pg. 82 of the 2016 paperback) The region is now called the Mohorovičić discontinuity. But that discovery was made before the First World War and deep geology hasn’t advanced very much in the intervening century. This book borrows the title of a Jules Verne novel published in 1864. If Verne came back to life, he would be pleased to see that his work is still popular, but he would be disappointed to see that the human race was no nearer reaching the centre of the earth. Asteroid impact and gamma-ray bursts are not the only catastrophes that threaten the continued existence of the human race. They may not even be the most likely. The film of life on the surface of the earth is fragile and one day it won’t be there any more. Or so scientists estimate. Will scanners be invented to prove their theories? Will probes ever get there and find out for real? We can hope so. In the meantime, this book is an excellent introduction to the ideas, the pioneers and the modern researchers into mysteries that are right beneath our doorsteps. Whether it’s discussing diamonds, demons or “Double-D-Prime”, Journey to the Centre of the Earth is popular science that’s interesting, entertaining and informative all at once. In Italy, the fire-god Vulcanus gave his name first to one fire-mountain, in the Aeloian archipelago, then to all of them (“Vulcano”, pg. 50). In Hawaii, Pele is the volcano-goddess, appearing either as “a tall beautiful young girl or a bent, ugly old woman” (“Hawaii”, pg. 122). Gods, goddesses and demons are everywhere in the stories told about volcanoes. That’s why Gods of Fire would have been a much better title. 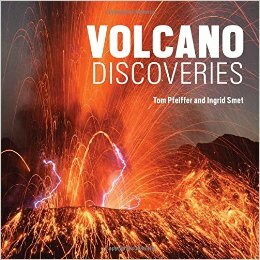 But the German volcanologist Tom Pfeiffer is presumably plugging his company VolcanoDiscovery. He supplies the photographs; the Belgian geologist Ingrid Smet supplies the text. His images and her words work well together, but there’s a collaboration in the images too, like the two aspects of Pele. Some of the images are fiery and full of action, as blazing lava fountains against starry skies or pours in blood-red rivers down a slope. Others are bleak: lifeless cones, grey ash-fields, black pavements of cooled lava. The two kinds of image contrast very effectively, as the book tours every volcanic region of the world from Iceland to Indonesia. And while some images are spectacular, some are small. The huge snow-covered cone of Shishaldin, “in the Aleutian chain”, is spectacular (pg. 141), like the vast plume of smoke belching from Fuego de Colima in Mexico (pg. 149) and the churning lava lake of Marum in the Pacific (pg. 175). Small images include ferns growing in cooled lava (pg. 139); yellow crystals of sulphur around the mouth of a “fumarolic vent” (pg. 74); and a close-up of “Pele’s hair”, or “elongated lava strings that quickly cooled down and became glass” (pg. 126). So there’s every scale, every stage of volcanic activity, and every kind of slope, steam-plume and smoke-cloud, plus lots of facts, figures and interesting asides in the texts. If you’re interested in volcanoes, the gods of fire are waiting here. If you can raise a glass of tequila to them, even better: “whereas volcanic soils are being used throughout the world to grow grapes for wine production, in Mexico they are used for cultivation of the blue agave – the plant from which tequila is distilled” (“Mexico”, pg. 143).